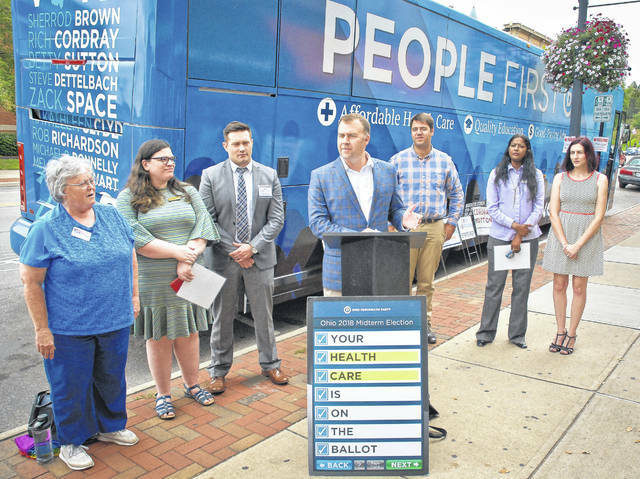 The Ohio Democratic Party rolled into downtown Delaware Tuesday afternoon in its big blue People First bus to meet the voters of Delaware. When the bus doors opened, six Democratic candidates emerged, all of whom are seeking various offices in the Nov. 4 general election. Pictured left to right are Kathleen Tate, candidate for State Representative, 68th District; Aileen Wagner, candidate for Delaware County Commissioner; Cory Hoffman, candidate for Ohio State Representative 67th District; David Pepper, Ohio Democratic Party Chairman; Danny O’Connor, candidate for Ohio’s 12th Congressional District; Indu Rajan, candidate for Delaware County Auditor; and Louise Valentine, candidate for Ohio State Senate 19th District. With early voting for the Nov. 6 general election set to begin on Wednesday, Oct. 10, the Ohio Democratic Party’s People First bus tour kicked off Tuesday at the Ohio Statehouse, and its first stop was outside City Hall in downtown Delaware, where voters were given the chance to meet the party’s candidates in various races involving Delaware County. On the tour Tuesday was Danny O’Connor, candidate for Ohio’s 12th Congressional District; Louise Valentine, candidate for Ohio Senate, 19th District; Cory Hoffman, candidate for Ohio House of Representatives, 67th District; Kathleen Tate, candidate for state representative, 68th District; Aileen Wagner, candidate for Delaware County Commissioner; and Indu Rajan, candidate for Delaware County Auditor. Pepper told the small crowd that gathered Tuesday afternoon near the large blue tour bus on South Sandusky Street that they, the Democratic voters, are “showing the country that grassroot energy can overcome big money.” He said O’Connor’s, D-Columbus, race against Rep. Troy Balderson, R-Zanesville, was basically a tie, even though O’Connor was outspent in his campaign in the Aug. 7 special election for Ohio’s 12th Congressional District. The party is traveling across Ohio in the People First bus, highlighting its agenda at county fairs, festivals, rallies, college campuses, cities and villages in every area of the state up until Election Day on Nov. 6. The bus was to stop in Delaware and Mansfield on Tuesday, and continue with stops the first week in New Philadelphia, Salem, Wooster, Findlay, Granville, Cincinnati, Bucyrus, Napoleon, Lorain, Elyria and Cleveland. “We’re an 88-county campaign this year,” Pepper said. The first week of the tour will culminate with the annual State Dinner on Sunday, Oct. 7, featuring keynote speaker U.S. Sen. Kamala Harris (D-California). This entry was tagged Aileen Wagner, Cory Hoffman, D. Anthony Botkin, Danny O’Connor, David Pepper, Indu Rajan, Kathleen Tate, Louise Valentin, Ohio Democratic Party, Ohio Democratic Party Chairman, People First. Bookmark the permalink.